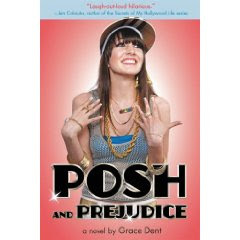 Posh and Prejudice by Grace Dent. Little Brown, June 2009. Reviewed from ARC from publisher. (The publisher link says a June 09 release date, as did the ARC, but all I can find at Amazon or B&N is the December 09 paperback release). The Plot: Shiraz Bailey Wood, 16, is waiting to hear about her exam results. Shiraz isn't sure what she wants -- but a dead end job, and a living the life her mother wants her to is NOT what she wants. So it's off to Mayflower Academy, AKA Superchav Academy, for another year of studies. The Good: Shiraz is hysterical. I love her, I love her world view. A little background. This is the second book in Dent's Diary of a Chav series. Do you have to read Diva without a Cause , the first book, to read this? No; but why wouldn't you? A Chav, is, well, a Chav is "Chav: (n.) A British insult for white working-class people fixated on street fashions derived from American hip-hop such as imitation gold and fake designer clothing, e.g.,"It's a bruv who wears crap clothing and manky gold jewelry, innit?"" It's an insult; and Shiraz explains she is not a Chav. And those who attend Superchav Academy (also known at one time as "the worst school in Britain") are not Chavs. Even though they may wear hoodies; and listen to hip hop; and are working class people on the lower socio-economic class. While this definition says "white," Dent's book portrays Shiraz's neighbors and classmates as a very modern Britain, with a mix of races, ethnicities, and religions. Shiraz is named for a drink. As is her older sister (Cava-Sue) and younger brother (Murphy). Yep. That says a lot, doesn't it? This year in Shiraz's life includes her best friend, Carrie, whose parents are the local people who made it good so the family has money so can spend it on anything; Uma, the "real Chav" who surprises everyone with her grades; Wesley Barrington Bains II, Shiraz's boyfriend; and the new kids at school, including Joshua Fallow, who if this was set in the US I'd call an uberpreppie but in Shiraz's world is, I guess, "posh." Shiraz talks about school, and her subjects, and what she likes, and how hard it is, especially without support at home; but it's all very funny and part of me was tempted to write this all in Shiraz speak, ending every sentence with, innit. Except, I'm not funny like Grace Dent (or Shiraz) is. When Shiraz explains about a show she and her friends put on, and the outfits the participants insist on wearing -- you're just going to have to read it. Dent (and Shiraz), while being funny, shows respect for Shiraz's working class world. "My mother -- Mrs Diane Wood -- says work ain't meant to be exciting. Mum reckons the important thing is that I'm bringing home some cash and earning my keep." So Mum's reaction to Shiraz staying in school? "Oh, bleeding wonderful!" said Mum, pointing at me. "Another one of my kids farting about after school instead of earning a living." Yes, Shiraz wants something different from what her Mom expects; but Dent does not talk down to Mum, and shows these characters great respect. While also having a few laughs. She's not laughing at them; we're laughing with them. The Wesley/Shiraz relationship is brilliant; I don't want to say too much, but Dent does a great job of showing a realistic relationship between two people who have some things in common but are separated by other things. So, ultimately, who is Shiraz? Is she Chav, or Posh? What are her own prejudices, and how will that help, or hurt, her future choices? If you're worried about the words and slang, there is a glossary (see the definition of Chav, above). But, if you've watched any BBC shows or British shows, or read other books set in the UK, the words aren't that unfamiliar. In Britain, there are already six titles in this series, so I'm already looking forward to the next book. If you don't mind spoilers galore, check out the blingtastic website for Shiraz Bailey Wood. There's just one problem with these books - after I finish, it's hard to keep myself from talking like Shiraz. Seriously, it's an effort not to say things like "proper excited" and "oh my days." This sounds like Louise Rennison's Georgia Nicolson series. There's a dictionary in the back of those books,too, but it sounds like I'd be using it more when reading THIS series. LOL. Sounds funny. I'll have to add this to my list. Sarah, I was so so close to writing this in Shiraz Speak because she had taken over my brain. Celise, Shiraz/Georgia are definately similar! But Shiraz is not quite so self-involved as Georgia.